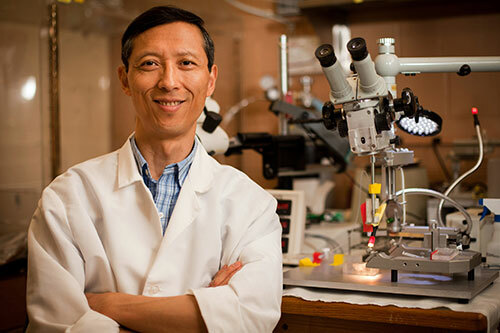 Research led by Dr. Riyi Shi, who holds a joint appointment as professor of neuroscience and biomedical engineering in Purdue Veterinary Medicine's Department of Basic Medical Sciences (BMS) and the Weldon School of Biomedical Engineering, has identified a key component in cigarette smoke that worsens pain in people with spinal cord injury. "The findings support anecdotal information suggesting that smoking increases pain in patients with spinal cord injuries," said Dr. Shi. "This neuropathic pain could be felt in the leg and upper extremities, or in any part of the body." The research showed that a neurotoxin called acrolein contained in cigarette smoke intensified neuropathic pain after spinal cord injuries in rats. Acrolein is known to worsen pain by activating and causing a proliferation of pain receptors called TRPA1 (Transient Receptor Potential Ankyrin-1), found in nerve fibers. The findings, detailed in a research paper co-authored by Dr. Shi, BMS graduate research assistant Glen Acosta and biomedical engineering graduate student Breanne Butler, are set to appear August 15 in the Journal of Neurological Sciences. The paper was published online May 22. The study was funded by the National Institutes of Health and the Indiana State Department of Health. "Previously, it was reported that people with spinal cord injury-induced chronic neuropathic pain have experienced heightened pain sensitivity when smoking tobacco cigarettes, and less pain following the termination of smoking," Dr. Shi said. "However, the molecular mechanisms of smoke-induced hypersensitivity are not yet clear. We show in the current study not only that the inhalation of cigarette smoke can worsen the pain, but inhaling acrolein alone, apart from cigarette smoke, at a concentration similar to that emitted from cigarettes, can produce significant increases in pain-related behavior after spinal cord injury as well. Furthermore, the intensified pain behavior due to acrolein inhalation was reduced when an acrolein scavenger, phenelzine, was administered to the animals during acrolein exposure." The study could open the door to a variety of possible preventive or therapeutic approaches to mitigate pain affecting the quality of life in spinal cord injury victims. One of the principal impacts of the discovery is the possibility of reducing pain by using acrolein-scavenging drugs such as phenelzine, an anti-depressant approved by the U.S. Food and Drug Administration. Other potential FDA-approved anti-acrolein drugs, including hydralazine, a medication for hypertension, and dimercaprol, an acute heavy metal poisoning treatment, have been tested and shown to be effective acrolein scavengers in Dr. Shi's lab. For people with spinal cord injuries, the drugs are thought to mitigate pain in active smokers as well as those with pain caused by second-hand smoke. Click here to view a complete Purdue news release about the research.